It really does belong in Middle Earth rather than here, in a quiet area of northern St Petersburg. Your bus arrives at the crossing of Tikhoretskiy and Svetlanovskiy avenues, you turn your head, and eerily lit, against the dark sky, you see a giant tower. It is a lot less sinister in fact, and indeed not at all mystical. The tower is part of the Russian State Scientific Centre for Robotics and Technical Cybernetics (RTC), which occupies an entire block, between residential buildings, a huge park which also includes a shooting range, and late 19th century farmhouses – designed by architect Julius Benois and now functioning as a cultural centre. The buildings, designed by Boris Artyushin and Stanislav Savin, were constructed between 1973 and 1986. 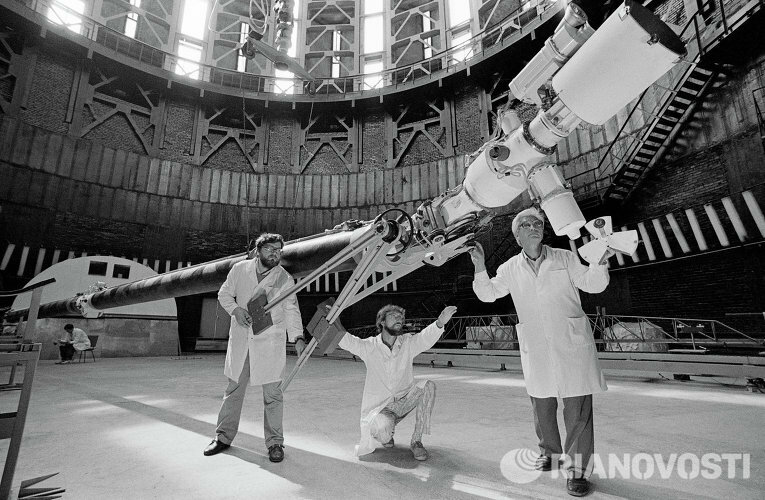 RTC was Soviet Union’s chief designer of robots and other cutting-edge electronics. Elements produced there were used in the Soviet space programme, and Russia’s earliest Internet connections were established from here. The tower, which is 104 metres tall to the top of the antenna mast, was designed for gravity-free tests. I regret to say that it is closed to visitors (although some daredevils did sneak through). It’s usually presented as an example of out-there late-Soviet architecture, but at any rate, it is one of the most distinctive buildings in this part of the city, or even in this city full stop – and I’m always in awe when I’m in the vicinity.